Researchers identify a previously unknown mechanism in cancer metastasis. The epidermal growth factor receptor (EGFR) is a potent tyrosine kinase, which regulates basic cell functions such as proliferation. EGFR has been strongly associated with poor prognosis in many types of cancer, prompting the design of highly specific and potent EGFR inhibitors to control tumour growth and metastasis, Currently, EGFR-targeted therapies are used as an additional line of anticancer treatments in patients with non–small-cell lung cancer, pancreatic cancer, head and neck cancer, colorectal cancer, and malignant gliomas. However, mutations of certain cancer-related genes along with acquired EGFR-activating mutations are thought to cause cancer resistance to EFGR-targeted therapies. Therefore, it is a priority for many oncology-based groups globally to enable greater efficacy in drugs targetting this main player in cancer support. Now, a study from researchers at The Scripps Research Institute (TSRI) has shown that EGFR initiates an additional mechanism which appears to ‘seed’ the body with metastatic cells long before doctors would typically detect a primary tumour. The team state that EGFR encourages blood vessel growth early in tumour development, feeding the primary tumour and providing vehicles for the cancer to metastasize. The opensource study is published in the journal Neoplasia. Previous studies from the lab had shown that, compared with tumours expressing low levels of EGFR, high-level-EGFR tumours delivered 10- to 100-times more tumour cells to secondary organs. Findings showed that when cancer cells have high levels of EGFR, the tumour has a lot of new, angiogenic blood vessels. These vessels are very welcoming for tumour cells and facilitate their dissemination from the very early stages of tumor development. When the group downregulated EGFR so it wasn’t expressed anymore, the tumour cells were not able to disseminate efficiently. This suggested that EGFR plays a role in the early step of metastatic dissemination during which tumour cells enter angiogenic blood vessels. The current study shows how EGFR levels make a difference and how it helps with this intravasation. The current study used chick embryos to show that EGFR signaling started a chain reaction inside tumour cells, ultimately resulting in the release of a molecule called vascular endothelial growth factor (VEGF), known to be active in almost all forms of solid tumours. Data findings show that released VEGF then binds to endothelial cells, inducing the growth of new blood capillaries and vessels within a developing tumour. Results show that these vessels are actually useful for tumours because they are dilated and unusually permeable; tumour cells can then slip into the vessels, escape the primary tumour site and lodge throughout the body. The team explain that escaped cells often lie dormant or grow very slowly, not appearing as metastases until after the primary tumour is detected. They go on to add that this could also explain why EGFR-inhibiting drugs have had limited success in human patients. The group conclude that while these drugs target EGFR’s effects in primary tumour growth, they don’t address EGFR’s role in blood vessel growth and early metastatic seeding. The team surmise that their study shows that vascular dissemination of tumour cells responsible for metastatic disease can occur much earlier than the time frame when anti-EGFR therapy is initiated in most cancer patients. They go on to add that the success of any anti-EGFR therapy might be limited to the early stages of cancer progression when EGFR inhibitors would effectively target developing intratumoral vasculature. For the future, the researchers state that their findings highlight the urgent need for new methods to diagnose cancers early and new treatments to fight growing metastases. Tumor cell EGFR regulates the development and microarchitecture of intratumoral intravasation-sustaining angiogenic vasculature. GFP-labeled HT-hi/diss cells were treated with control (siCtrl) or EGFR (siEGFR) siRNAs and grafted on the CAM of chick embryos. 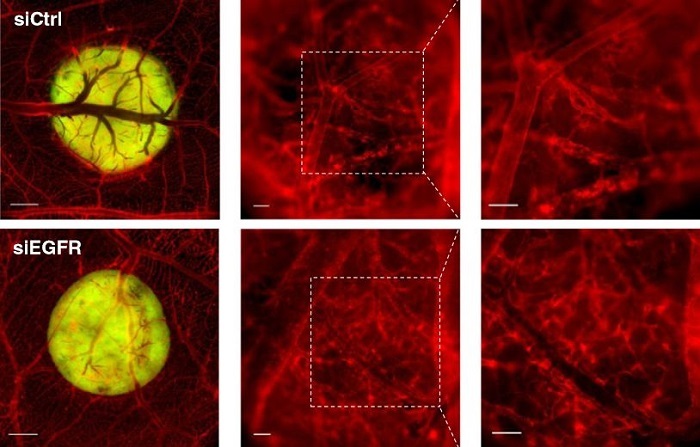 On day 5, the fluorescently labeled vasculature (red) was examined around and within topical microtumors (green) at an original magnification of 20× (left; bar, 1 mm), 100× (middle; bar, 100 μm), and 200× (right; bar, 100 μm). Digital images of 30 control and 25 EGFR-deficient microtumors were analyzed for the overall density. EGFR Regulates the Development and Microarchitecture of Intratumoral Angiogenic Vasculature Capable of Sustaining Cancer Cell Intravasation. Deryugina et al 2015.